Lomography, the makers of the popular analogue film cameras, has offered up some reasons why it thinks that it is proving so successful at the moment. As part of that success, Lomography is about to launch a new pop-up shop in Birmingham. 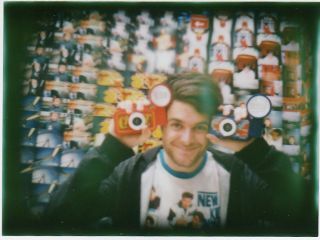 We spoke to Mark Appleton, the Key Accounts Manager for Lomography UK, about the secret of its good fortune. "I think more and more people are getting bored with the same kind of image that digital provides," he told us, "especially those that compact cameras provide." Lomography cameras are distinguished by their unpredictable nature, which includes light leaks, blurry images and odd colours. "It doesn't matter what you use, but with us, every single one of our products produces different effects, so even if you and your friend buy the exact same camera, you will still get different results," Appleton continued. Lots of different cameras are produced by the company, with recent additions including the Sprocket Rocket, La Sardina and most recently, the LomoKino which can record short films onto 35mm film. Though some people may be put off by the low quality aesthetic, it is this which Appleton believes makes the cameras so appealing, "Most of the pictures aren't supposed to be completely in focus, but it's got a lot more heart behind it, so in a way, it's a lot more realistic to the atmosphere, though it is of course very different to digital." The popularity of Lomo comes at a time when many of its users will have grown up in a completely digital age, and may never have experienced analogue before. It's that alien concept which may be what is so appealing about it, "They needed something different, a lot of people haven't used film before, and now it's quite refreshing waiting for it to come back from the lab, it's just fun!" Lomo currently has three standalone stores in London and Manchester, with several more pop-up shops planned throughout the UK in 2012. Although Appleton is keeping tight-lipped on where exactly these will be, he points out that he's keen to build new communities around the country. The Selfridges Birmingham pop-up Lomo shop is now open.